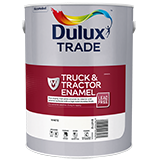 Dulux Trade Truck and Tractor Enamel is a quick drying, high gloss enamel for interior/exterior surfaces where a glossy durable finish is required. Full high gloss finish - ideal for all tractors and implements. Large colour range - all colours are colour matched to Tractor & Implement manufacturers' colour standards.